Premise: Hazel Lancaster has cancer. Her prognosis is not good – her disease is terminal. But because of a miracle drug, she’s got some time. She lives with constant pain, requiring a steady stream of oxygen to keep breathing, and she worries about the pain and grief that she knows her parents will suffer once she finally succumbs to her illness. She’s made her peace with her limited existence, and her life is something she takes from day to day. When Hazel meets Augustus Waters, she never expects to fall in love. But Augustus – a cancer survivor who lost his leg – is charming, sweet and crazy good looking. The two develop an immediate and intense bond. 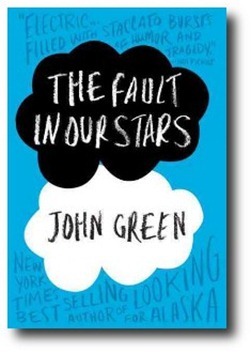 Hazel struggles with her reluctance to put Augustus through the heartbreak that her death is sure to cause him. But Augustus knows that when you are living on borrowed time, you have to treasure all the love you can find. Hazel’s cancer is terminal. She is in constant pain, and at one point she is hospitalized and put into the ICU when her lungs fill with fluid and oxygen cannot get to her brain. One character, Isaac, lost an eye to cancer and must undergo surgery when the cancer affects his remaining eye. He becomes blind. Hazel and Augustus lose their virginity together. The scene is vague with no explicit descriptions. Augustus’s cancer returns and becomes terminal. Hazel remains with him during his rapid decline and subsequent death. This depiction is very intense and may be too much for sensitive readers. Thanks for the heads-up. I often copy previous reviews as a template to write up a new review, and I must have forgotten to change the profanity information. I’ll make the correction. Thanks! Super helpful and just what I needed.